What Type of Communicator Are you? Are you Polite or Trustworthy? Customers don’t use logic to make buying decisions, they buy things for emotional reasons. Today we want to talk about one of the most important elements of your marketing: emotional marketing. In 2017, a behavioral economist named Richard Thaler won a Nobel prize for proving that people are anything but rational when it comes to decision making. Emotions are what really incite action. - Our buying decisions are not based on logic and calculation - It’s not conscious - We do convince ourselves that we’re rational - But our marketing should not be about features and benefits - We don’t mean fake emotion or manipulation. What can business owners do to make their marketing emotional? - Know your audience – What will they respond to most? - Tell good stories - Inspire people to reach their lofty dreams - Project an ideal image - Make people feel - Use video - Create a sense of community Find out more about Mike and Maria Keiser, The Entrepreneur Circle, and other small business solutions http://mentalcompass.com New Episodes every week. 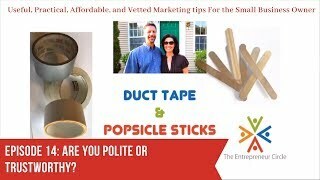 Never miss an episode Subscribe to Duct Tape and Popsicle Sticks video series https://www.youtube.com/playlist?list... Our podcast Grow your Small Business Our Podcast Grow your small business http://mentalcompass.com/grow-your-sm... Stay connected and get access to our other content designed to help Small business owners Facebook https://www.facebook.com/theentrepren... Twitter https://twitter.com/TheEcircle Linkedin https://www.linkedin.com/company/the-... The Entrepreneur Circle is located in Manchester, Connecticut and helps small business owners solve their marketing needs. Imagine if you could be the one in charge on a cold call? Most phone scripts can sound robotic and passive. They seem to be designed to make the caller seem like a subordinate, asking for just a few minutes of your time. Or promising not to sell you anything. That’s poppycock! You are trying to sell them something, so take charge of the call. People want to buy from someone who knows what they are talking about. Someone who they can trust to guide them through the process. Not someone begging for scraps of time. If you want to have more success with your cold calls, try the assertive approach. Act like someone people buy from. Find out more about Mike and Maria Keiser, The Entrepreneur Circle, and other small business solutions http://mentalcompass.com New Episodes every week. 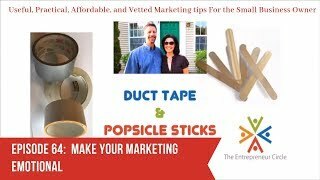 Never miss an episode Subscribe to Duct Tape and Popsicle Sticks video series https://www.youtube.com/playlist?list=PLWWnmpONTiC_xxyJXU4JlfUQZ9MI1X3HD Our podcast Grow your Small Business Our Podcast Grow your small business http://mentalcompass.com/grow-your-small-business-podcast/ Stay connected and get access to our other content designed to help Small business owners Facebook https://www.facebook.com/theentrepreneurcircle/ Twitter https://twitter.com/TheEcircle Linkedin https://www.linkedin.com/company/the-entrepreneur-circle/ The Entrepreneur Circle is located in Manchester, Connecticut and helps small business owners solve their marketing needs. In our last show, we answered the question “what type of communicator are you?” Today, we’re going to focus on the style that gets results; assertive communication. It seems that people are often afraid to use assertive communication. - Want to be polite - Don’t want to hurt feelings - Don’t want to appear aggressive - But are often left unsatisfied or don’t get results **Don’t be afraid to ask people to take an action. Otherwise people may not know what you want them to do, and therefore not do anything. We are afraid of assertive communication (especially in our marketing) because we don’t want to come across as too pushy. However, we are often disappointed or frustrated at the result or “lack of results” our polite passive marketing communication got us. The best way to approach being assertive is by being more straightforward and transparent with your ask. Don’t worry so much about offending someone, worry more about creating a simple way of guiding your potential customers to attaining what they want. Find out more about Mike and Maria Keiser, The Entrepreneur Circle, and other small business solutions http://mentalcompass.com New Episodes every week. Never miss an episode Subscribe to this video series https://www.youtube.com/playlist?list=PLWWnmpONTiC_xxyJXU4JlfUQZ9MI1X3HD Our podcast Grow your Small Business Our Podcast Grow your small business http://mentalcompass.com/grow-your-small-business-podcast/ Stay connected and get access to our other content designed to help Small business owners Facebook https://www.facebook.com/theentrepreneurcircle/ Twitter https://twitter.com/TheEcircle Linkedin https://www.linkedin.com/company/the-entrepreneur-circle/ The Entrepreneur Circle is located in Manchester, Connecticut and helps small business owners solve their marketing needs. What type of communicator are you? There are 4 different types of communicators: Passive – “not a big deal” kind of style Aggressive – Always urgent, message gets lost Passive Aggressive – no responsibility for actions – may appear passive but are angry/disappointed in the background Assertive – state needs, actively listen Any successful relationship comes down to our communication and agreements. - What we say - What the other person understands - The agreements we come to Understanding your communication style will - Improve your relationships - Help avoid disappointment and frustration - Help you achieve your desired outcome - Help your marketing efforts Small business owners typically market passively or aggressively. Both styles can lead to frustration and disappointment. Remember to incorporate your assertive communication in your marketing. Let your audience know what you are asking for. Other videos on communication skills https://www.youtube.com/watch?v=hBEDzhm5tnE&t=1s Find out more about Mike and Maria Keiser, The Entrepreneur Circle, and other small business solutions http://mentalcompass.com New Episodes every week. Never miss an episode Subscribe to this video series https://www.youtube.com/playlist?list=PLWWnmpONTiC_xxyJXU4JlfUQZ9MI1X3HD Our podcast Grow your Small Business Our Podcast Grow your small business http://mentalcompass.com/grow-your-small-business-podcast/ Stay connected and get access to our other content designed to help Small business owners Facebook https://www.facebook.com/theentrepreneurcircle/ Twitter https://twitter.com/TheEcircle Linkedin https://www.linkedin.com/company/the-entrepreneur-circle/ The Entrepreneur Circle is located in Manchester, Connecticut and helps small business owners solve their marketing needs.